Big Red 10 Ton Hydraulic Bench Type Press - SWE046. There are jobs in the workshop where a press is the only safe means of inserting or disassembling a component. Pressing metallic bushes into leaf springs or parting an aged taper. This compact press is ideal for bench mounting and includes a pressure gauge registering the tonnage being applied. Max Height (Ram to Table): 340mm. Min Height (Ram to Table): 180mm. Note: All parts in the image will be supplied for the price shown. The pump must be mounted on the bench as shown in the image. These guys know more about jacks than anyone else in the world. Certified ISO9001 (CQCC); ISO4001 (Vouching Technical); ISO/TS16949 (TUV Reinland). Jacks and axle stands are a workshop tool where quality and certification cannot be compromised. UK Based business established 40+ years. Massive stocks held in our UK warehouse, not held in China! Every product comes with vatable invoice, VAT No: GB 765388288. We are engineers who know our jobs and only offer quality products. 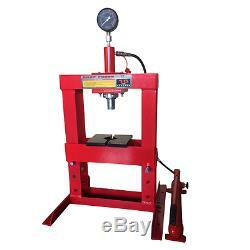 The item "Big Red Workshop Garage Hydraulic Press 10 Ton Tonne Bench Type Press (SWE046)" is in sale since Wednesday, October 25, 2017. This item is in the category "Vehicle Parts & Accessories\Garage Equipment & Tools\Workshop Equipment & Supplies\Workshop Presses". The seller is "rally-design" and is located in Whitstable.